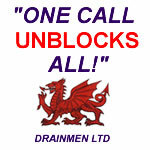 Cardiff Drainage - Drainmen LTD have all the equipment needed to perform CCTV Drain Surveys for cost effective inspections of sewers and drains. Using sophisticated CCTV equipment we are able to check the interior of your drains for any problems. We can check the structure and integrity of your drains without any digging or disruption to your environment. We can check for damage done by Rats and locate their point of access. We can then repair the damage accordingly. These are a common problem and can cause a lot of damage to your drain system. Using CCTV inspection equipment we can find the source of the problem.